Anyhoo, her nails were done briefly before mine, so she left the magazine she'd been reading open for me to see as I left the shop. Low and behold, THERE THEY WERE. 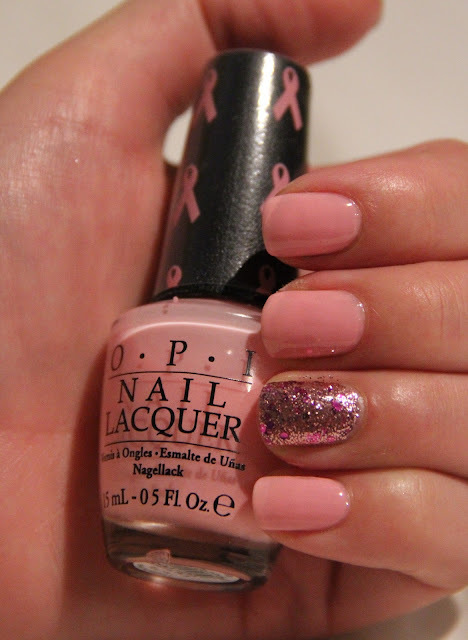 An ad for OPI's latest breast cancer foundation supporting polish duo's. I saw them, and I HAD to have them. En route to track down her and her Mum who'd gone shopping while they waited for me to finish up, I ducked into DJ's and bought these polishes. Months later the BF's Mum actually put them in my stocking at Christmas - thankfully, the glitter is a dear favourite, and I'm glad to have a back up!! The main colour I've got on here is I Think In Pink a sheer pale pink. This is one of few pale pinks I like, not wishy washy at all. Enough pigment and colour that it stands out enough for it to look intentional. Nothing I hate more that silly pale pinks that look like your own skin colour gone wrong. This was three coats and you could easily got another - patchy with very VNL, an extra coat wouldn't hurt, but I'd give it some extra drying time, this polish is slightly thicker than others. The glitter is a stand out. You Glitter Be Good To Me is tiny pink sparkles with larger brighter pink chunks of circular glitter. It goes on quite sheer (would look nice as a top coat) But I like my glitters to have oomph, so I just layered of three coats of itself. Sparkle-icious and attention seeking now - I can't even bare think about the removal later. I love this glitter, I'm so glad I ended up with two!